Home / Local services / MRFC / MRFC Summer Memberships are back! MRFC Summer Memberships are back! In what is quite possibly the single best deal for those of you that live in Muscat through the summer, the MRFC summer membership deal is back and bigger than ever! 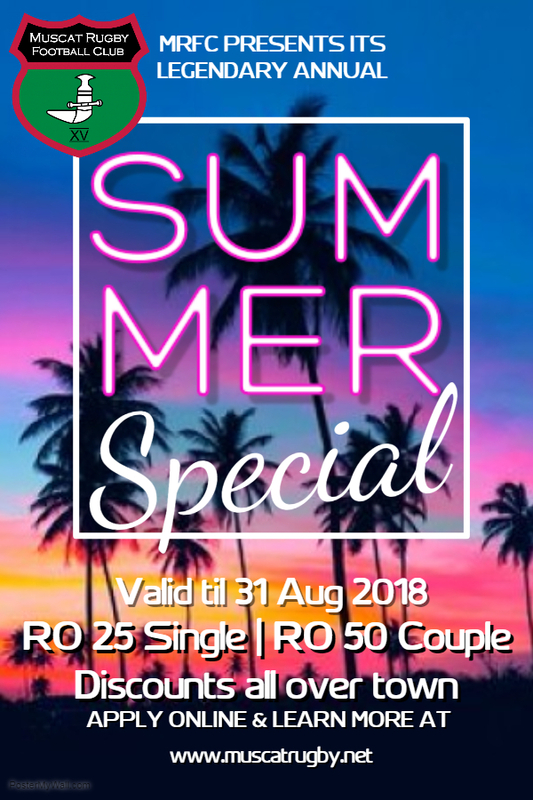 Valid from now (or whenever you sign up) until the 31st of August 2018, the MRFC Summer Special is valid. RO 25 per adult, RO 50 per couple (if you take a couples membership, MRFC will throw in up to 3 kids memberships for you - a kid is a kid until they are 18). Signing up is easy - fill in the form online as a Social Single or Social Family (couple) (remembering to include a photo(s) of your face(s) - it does not have to be a passport photo, just a clear picture of your face is enough) and someone from MRFC will be in touch. Pay cash when collecting your card, and thats it! Please note that all discounts afforded at the Grand Hyatt, Muscat are on the basis of 1 discount per card-holder (eg if you take 10 people to Tuscany for dinner, don't expect a 20% discount off everyone's bill). Also, the perks are not valid during Eid or Public Holidays. 2. 20% off F&B at Tuscany, Mokha Cafe (brunches), Sirj tea lounge, John Barry Bar, Marjan & Pool bar, and Habana Sports Bar after the Happy hour ends at 9pm. (GRAND HYATT) (Discount at Habana is off drinks only, not food). 4. RO 2.5 to access the Grand Hyatt pool until 1 June 2018, then its free to use the pool for June, July & August at the Grand Hyatt. A flat rate of RO 65 is available for a room at the Grand Hyatt, Muscat (including breakfast) any day of the week - when available. (If the hotel is fully booked, its not going to be able to offer you the special MRFC room rate). 8. All locations annual membership to Horizon Fitness for RO 89. 12. 20% off at Casper & Gambini's and Eatalian. 13. Special green fees and discounts on academy training courses for Muscat Hills. Still reading? Go and sign up! 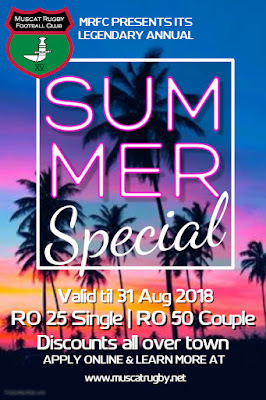 Its the best RO 25 you'll spend this summer!